CONCORD, NH – The New Hampshire Fish and Game Department will hold a public hearing on proposed rules to reduce the moose permit issuance for the 2019 moose hunting season. Wildlife season-setting rules are subject to the state’s rulemaking process. A public hearing will be held on Monday, April 8, at New Hampshire Fish and Game Department Headquarters, 11 Hazen Drive in Concord at 6:30 p.m. The complete rulemaking notice, with original and proposed rule language, can be viewed at www.wildnh.com/legislative/proposed-rules.html. Written comments must be received by April 16, 2019, and may be either emailed to comments@wildlife.nh.gov using the subject line “Comments on Moose Permits,” mailed to Executive Director, NH Fish and Game Department, 11 Hazen Drive, Concord, NH 03301, or sent by fax to (603) 271-1438. After considering public comment, the Wildlife Division will present the final rule package to the Fish and Game Commission at its April 18, 2019, meeting. The rules then go before the Joint Legislative Committee on Administrative Rules (JLCAR) for approval. The new rules will establish permit numbers to be issued in the 2019 moose permit lottery to be held in June. 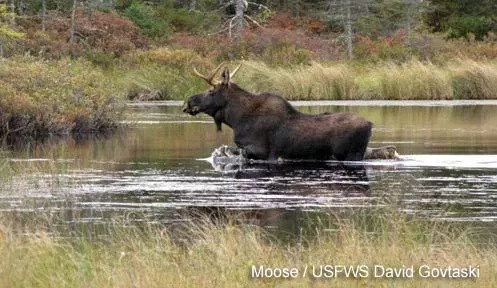 The New Hampshire Fish and Game Department has proposed the reduction of statewide moose hunt permit issuance from the 51 issued in 2018 to 49 in 2019. The estimated moose density in the Southwest Region, comprised of Moose Management Units H2-North, H2-South, and K has increased to levels which meet criteria established in the Moose Management Plan which eliminate the permit issuance suspension. As a result, the proposal would issue one (1) permit in each of these three units during the 2019 lottery. The proposal also would reduce permit numbers in the White Mountain Region (units C1, D2, E1, E2, E3, and F) from 15 to 10, with some permits continuing to be issued in all moose management units in that region. For more information on rule setting or the moose lottery, visit wildnh.com. This entry was posted in Uncategorized on March 19, 2019 by GrowingInArt.